Able to use hands? - Mostly - some of her fingers are 'webbed' together as part of the illness and she's had major surgery to have these reopened. At present she can write, paint colour, etc. Please don’t send hard or sharp things, feathery things that may damage her eyes, or anything that may damage Rida’s skin. Please note both Rida and Amina do not eat non-halal meat so please be mindful of this when sending post to them. 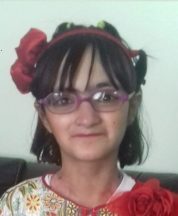 Rida was born with RDEB (recessive dystrophic epidermolysis bullosa). This is a rare and painful skin condition in which the ‘glue’ that holds the skin together is missing. So any minor trauma or friction causes her skin to shear or a wound to occur. This is the same with eyes, ears etc. Rida is on overnight feeds as she cannot drink due to the dangers of aspirating caused by the EB. At birth she had no skin on her right leg, left heel, both elbows and a patch on her tummy. It’s all healed but her right leg is still extremely sensitive. Rida takes it all in her stride. She never lets anything stop her even though she’s in constant pain. EB affects the eyes the same way, it also causes blisters which we have to burst and dress. These can occur for no reason and do so on a daily basis. She often gets them in her throat causing her to vomit blood. In January 2015 Rida is supposed to be having major hand surgery. This can take up to six weeks as she will have to go back to GOSH weekly for three weeks to have her dressings changed under general anaesthetic. Her fingers are fused together and they are operating to open the gap back using skin grafts from her back or thigh. Rida has never ever complained and is always happy and smiling. She is an inspiration to everyone who knows her. Rida’s sister is called Amina and is also a Pal with her own page. Amina had an admission in September. She missed the start of school. Had a broken gastrostomy which then became infected causing severe discomfort and pain. It was removed and the decision made to leave it out. She may have 1 more admission before xmas and now really struggles because she hates missing school. Rida has had a horrendous time lately. Her wounds have been so extensive to the point where we have been unable to bath her for weeks. It’s been extremely difficult to watch her cry in pain. To add to this she’s had unexplained back pain and chest pain which nobody can understandand has had so much time off school. She’s struggling to walk and her team want her to start using a wheelchair to make her more comfortable. This will benefit her but will be extremely difficult for us as parents to see our 10 year old in a wheelchair. I’d like to thank everyone single person for their post. All the letters, cards, gifts everything. The fact that you lovely people take time out of your day to put a.smile on my child’s face means more to us as parents than anyone can possibly know. Thank you. Rida is really struggling in the heat. Her wounds are getting larger, more severe and painful. Bath time is horrendous and she screams the house down and now the same is happening at bedtime because her body relaxes and she feels the pain more. Dressing changes are also awful. She’s missed so much school due to pain. Rida loved the party and her favourite part was the beauty parlour. She enjoyed the lucky dip and made some cute key rings at the craft table. It did take its toll once we got home and we had lots of tears but she had a fab day. Thank you to everyone who worked so hard to make it happen. We are waiting on surgery date for her hand operation. Her hands are getting worse and her fingers are getting more fused making them smaller. Thank you for all the post she’s gotten. She likes to read the letters herself now. We’ve been very busy Miss Rida wise! We went away which kind of turned into a nightmare. Rida’s throat was all but closed and she was surviving solely on feeds. She was choking on everything, which was hard to watch. She was slamming cupboards in frustration as there was nothing she could eat. We came home mid April and we got her in for surgery asap and had her 5th esophageal dilatation. Her oesophagus was 4mm. She’s ok throat wise, but is now on the list for hand surgery as her fingers are fusing together. This will be a six week process and very painful. I will update more once we have dates. Currently both are looking forward to Eid! Thanks going out to every single person. Ellie, Beverley, Bev, Sylvia and Roy, Anna, Wendy and Charles, Rebecca, Badge, Gaynor, Ginny – too many to name but all those who have asked or sent post we are really so grateful as it allows a sense of normality. Another admission for Amina and leaving Rida home has left both girls distraught. Amina is currently on day 9 of IVs. She is obsessed with Harry Potter. Her collection of stationary is still growing too. She’s doing the O2 climb so is looking forward to that. As always, massive thank you to every single person who took the time to send cards, letters, emails, and gifts. Some names: Ellie, Wendy, Beverly, Bev, Dawn and Steve. There’s so many I can’t name everyone, but thank you. Rida is heading towards more throat surgery. She had bloods done recently which was extremely traumatic and she screamed and cried. She also had an accident pulling the skin off her hand and wrist which had to be pushed back as it lifted off like a glove. This was very painful and took ages to heal as the blisters kept reoccurring. Currently her waist and left leg are very very damaged and need changing often. She’s due a heart scan as she keeps getting chest pains and the doctors are concerned. Rida was upset when Amina went hospital as she is getting older and understands more that the family is split in half. Rida has a possible overnighter on 4th May and they will decide about more throat surgery. It will be her 5th. She’s due for hand surgery at the end of the year as well. It will be a difficult time as it’s a 6 week process. Rida had surgery for her throat at the end of August just before Amina’s admission. This was her 4th throat operation and they told us it had closed to 4mm which is why she was struggling to eat and swallow. Currently she has massive bleeding wounds on her right leg. These are so severe that they need changing twice a day. They are bleeding right through the dressings. She’s so brave that she never complains and it’s heartbreaking to see the size and extent of the damage on her little leg. Her waist is also very damaged. It’s also got extensive wounds, then yesterday she dropped a shoe on her foot and hurt her toe. I’d like to thank each and every person that sent letters, cards, gifts, big or small over the holiday period. Christmas was amazing and they had so many gifts. It’s overwhelming how much people who have never met can care. Extra thanks to Vikki for this amazing page and group. Rida has been having a very tough time. She has huge extensive wounds on both legs and massive sore areas on her waist. These are having to be changed daily and results in pain and tears. She also has wounds and dressings under each arm and these are fortunately healing. The waist wounds are very deep and bleed a lot. The cream used stings and she cries when it’s put on. There are wounds on her knees and behind her knees and also 1 ankle. This is all making daily life a struggle. We have recently been told she may have a heart problem and are awaiting an appointment from cardiology. She is also going to be referred for surgery on her hands as her fingers have fused quite far up. This is a 6 week process. Her eye is also starting to stick to her lower eyelid and may also require surgery. Despite all this she is always smiling and happy. Thank you to everyone who has sent post to both girls. Anything no matter the size makes so much difference. The smiles are priceless. For the past 5 nights she has been waking at random times and started to gag, retch and dry heave. She’s saying there is a blister in her throat as these are the usual symptoms. However after almost 2 hours of this and exhausting herself it wore off and she fell asleep. This was Monday night. The same thing happened on Tuesday. Then again on Wednesday when she woke at 3.30am and was up spitting whilst gagging and retching until 5am. There was nothing we could do except hold her and console her. After speaking to her nurses they think she not only needs an emergency oesophageal dilation but also its a stricture that is causing this. When she lays down, pressure on the oesophagus is causing this. Needless to say it’s a nightmare to watch. She’s been booked in for emergency surgery on Tuesday. Along with this her lower eyelid was slightly attached to her eyeball due to an old blister, this seems to be spreading so we could be looking at eye surgery as well. She is refusing to sleep due to fear of the waking episodes. She hasn’t eaten for 5 days and is surviving solely on her overnight feeds. Rida has had two accidents at school. The first time she tripped over a drain and wounded her leg. The following day another child tripped over her foot causing a huge blister underneath her foot. She is currently unable to wear shoes or walk for long periods of time and is in pain. Then at 2am she woke crying as she had a blister in her throat. She spent an hour gagging and retching while we tried to get her to eat ‘sharp’ food in the hope it would burst. Well over an hour later it burst and she did a blood vomit, then fell asleep as she was exhausted. The following day I went to bath her only to discover her vest stuck to a huge wound under her arm. I had to slowly rip it off and it was horrendous … she didn’t even cry, she was so brave. I would like to thank each and every single person for their gifts, letters, cards and emails. The look on the girl’s faces is priceless and it wouldn’t be possible without you wonderful people. Thank you. Rida has just informed us of a huge blister on the back of her left leg. It’s been burst and dressed. She’s now in pain as she cannot straighten her leg and is crying, also she’s upset as she knows about Amina and doesn’t want her to go to theatre. Rida is having problems with wounds on her neck. They are recurring and unfortunately as they are in a strange area they cannot be dressed. Her hair gets stuck in the wound and has to be pulled out. As you can imagine this is very painful, yet she never complains. She now has dressings on both legs as her other leg is also damaged. Surgery also looks impending for her throat – for the 4th time – as she’s choking on food again.Thank you to Post Pals for the butterfly project. They are really enjoying that! Also, thank you for the make up and the dream catcher and jewellery gift from a Pal. Thank you for Rida’s stitch soft toy … even though she was afraid of it at first! Rida had a scare recently; she became very unwell and ended up in A&E. It was a very frightening time as her head was effectively ‘leaking’ some sort of fluid, to the point where I was wiping it away for hours on end. It slowly (over 2 days) stopped. She then got a lump on the back of her neck which the doctors said may be cancerous and needs to be checked. Needless to say, our world stopped spinning. We went to Great Ormond St. and had it checked. Turns out it was all a huge infection and the lump was a reaction to the infection. Phew! She just took it all in her stride. Presently she has a massive raw patch on her bottom, and she had a blister under her arm the size of a large marble. Yet she hasn’t complained or cried once. Big thanks to Wendy, Claire, Ginny and everyone else. Also to the extra smiles team for the cake! Rida’s skin is sore on her elbow and left leg. There seems to have been an infection because the wound became filled with yellow stuff. It was hard watching her go all quiet and subdued, which is what she does when in pain. It’s now healing but as with her sister, losing her grandad has hit her hard and she is finding it difficult to accept she won’t see him again. I’d like to thank Ginny and Wendy and everyone else for all the post, cards, gifts, emails, and massive thanks to Sarah Torode for the extra smiles boxes and the balloons. We just had to make an unexpected trip to Pakistan as the girls’ grandad passed away. It was so sudden and shocking as he wasn’t even unwell. They are devastated and the extra smiles boxes really could not have come at a better time. They managed to put a huge smile on their faces. Rida is ok, she has some really sore areas but was too sad about losing her grandad to complain. It was horrible seeing her so upset. Now we are home they are even more upset because they say granny is on her own. Apart from this, onwards and upwards. Massive thank you to Ginny, Wendy, Anne and the school in Cyprus for the presents. Also to everyone who wrote an email, letter, card, etc. thank you all so much. Rida is very sore. She has large wounds on the back of her leg and is having dressings done almost daily. It’s heartbreaking to watch. How she isn’t screaming in agony is beyond me. Onto the thank yous. I don’t even know where to begin! I would like to thank each and every single person for all their letters cards, gifts, emails and messages. Massive huge thank you to each and every single person that sent cards, letters, presents and even emails. You guys seriously have no idea of the smiles you are making possible. Wendy is our regular sender so a huge thank you to her and also Claire. There’s so many I don’t know where to start. Rida has hurt her foot – again. And yesterday she got too close to the DVD player, head butting it and taking a bit of skin off her forehead. Then today she got hit in the face with Iron Man whilst playing with her sister and now has a nasty wound on her chin. Not a good way to begin school. She has a big appointment coming up and may need some help in the form of foam or wedge-y type things in her shoes to bring her feet out as they are starting to turn inwards, causing her to hunch. Not sure how she will react to this. Rida is having an emergency operation tomorrow as her throat is closing up due to scarring. She was okay about it, but seeing her sister Amina upset has upset her too and now she also cries at the smallest thing. To sum up, I have two very poorly and very sad children at the moment. Saying this, I am hoping to take them both to Lapland on Wednesday, so please send positive vibes that they are well enough to go. 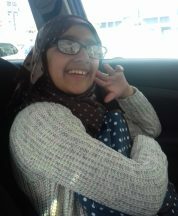 Rida has hurt her foot quite badly, and she also ended up in A&E with chest pains a few days ago. The chest pains were viral and are now a little better. Her foot is slowly healing, but she has had a lot of time off school already. Her ear is also sore and there may be an internal infection. She’s already had one infection. Amina is due a hospital admission, and the worst part of all this is it’s Rida’s birthday on the 8th of October and it seems more than likely we will be in hospital with Amina during this time. There’s no way around it and we will have to celebrate afterwards. On the upside, she’s looking forward to seeing how many cards she will get from her Post Pals and if it will be more than Amina! We have been given a new house, so should be moving in the next week or so. I will be running backwards and forwards from the hospital to the house, as I want the girl’s room all decorated before Amina comes home, as a surprise. Rida had an appointment recently and was told she had an infection in her wound that could be potentially dangerous, so she’s now on medication. She also had a blood test done and had to be held down by three people, which was very distressing. The physio has also told us she will need special soles made to put in her shoes as her feet are bending inwards. This should fix the problem over time. Thank you for the girls’ post. Please can I ask that Rida isn’t sent any small plastic confetti in cards though, as there was a bunch in one of her letters and as she opened it, it hit her in the eye, resulting in a damaged eye. Thanks again. Both girls are now home but they are slightly struggling with the heat due to their illnesses. 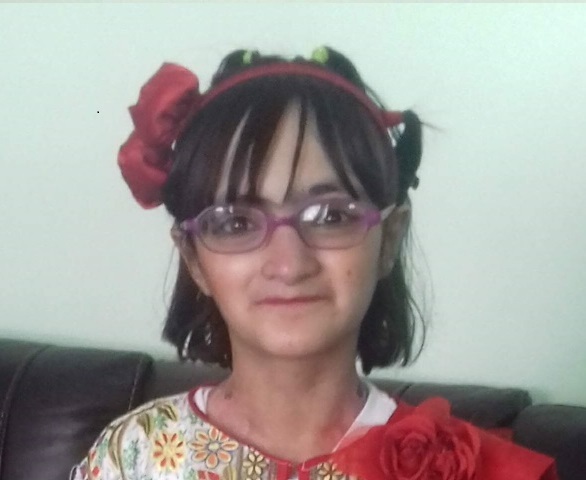 It’s particularly hard for Rida as she has all her dressings on and then her clothes on top. She also isn’t allowed to drink anything so that makes it even worse. I hope it doesn’t get too much hotter. Thank you to Wendy for the sticker books and also to the paper cutting group. I got a beautiful frame and so did Rida. Big thanks to Emma Jenkins for my frame and gift, it made my day! Rida is in a great deal of pain at the moment. Due to summer weather, her dressings are making her itch more than usual and causing new wounds. She has a big sore on the back of her left knee which means she has been unable to stand straight for almost a week now. It heals and then she scratches and we are back to square one. It’s not always easy to bathe her as bathing can be painful and we are running out of distractions. At the moment I’ve been doing her dressing 4-5 times a week, which take up to 1-2 hours at a time and is extremely hard work, as you can imagine. Hopefully now Amina is home from hospital we can concentrate a bit more on Rida. I don’t know if I’m coming or going at the moment, and Ramadan also started today so we are now fasting as well. I wouldn’t change my girls for the world. My beautiful princesses. A massive thank you to the ‘we love paper cutting group’ for Rida’s frame. Thank you for all our post. I love you all lots for the smiles you put on my girls’ faces. Words can’t describe the meaning and importance of what you’re doing for these children! Amina’s on day 17 in hospital with no news of when she’s coming home. Rida is really missing her sister now as they have never gone this long without seeing each other. Rida is well at the moment but is upset seeing Amina so unwell. Amina is waiting to be admitted to hospital for IV antibiotics. Times are hard and frustrating at the moment and I still have no hearing. The girls are doing ok this month, although we have had some very bad news. I have unfortunately lost hearing in both ears and am now totally deaf. Doctors are baffled as it happened over 10 days. The girls are coping very well and at the moment we communicate via writing and a board. Amina writes what she wants to say and Rida just uses hand gestures. I am still having various treatments so hopefully it comes back. It has made things extremely difficult in terms of communicating with Amina and Rida’s medical professionals. Amina is due a hospital admission soon and my hearing loss is going to make things a lot harder. I can’t tell you how happy little miss has been because all the well wishers have ensured she hasn’t been left out as it was Amina’s birthday recently. However she received so much stuff as well she though it was her birthday too! Rida had surgery on her hand on 10th February and 17th February. Then on 24th February she had another surgery and rather than taking five teeth out as planned, they took out seven! During this time Amina has her IV’s admission and it will be very hard to juggle both sets of admissions, especially as their respective hospitals are at the other end of the city from one another. Wish me luck!